Painted in 1630, this portrait exemplifies the depiction of women at the top of the social order in Spain, then the superpower in Europe. The subject is a princess (infanta in Spanish) of the Habsburg family that had ruled the country since 1516. Infanta María Ana (1606–1646) was the beloved sister of King Philip IV, who was not only the most powerful monarch of his day, but also one of the greatest art patrons and collectors of all time. From birth, the Infanta was one of the most eligible royal brides in Europe and she had many suitors. Most famously, she was courted by the Prince of Wales (later King Charles I of England), who in 1623 travelled incognito to Madrid to meet her. The surprise visit made news across Europe, particularly as the linking of the two monarchies had strategic advantages for both sides. However, the prince’s Protestant faith proved to be an insurmountable obstacle for the Spanish Habsburgs, who were leaders of the Catholic cause in the wars of religion that devastated Europe in the sixteenth and seventeenth centuries. This likeness of the Infanta was taken in late 1629, just as she was about to leave Madrid to journey to Vienna to marry her Austrian Habsburg cousin, Ferdinand III, King of Hungary and Bohemia. When Ferdinand’s father died in 1637, the couple became Holy Roman Emperor and Empress, ruling over much of Central Europe, including modern-day Germany and Austria. Exceptionally for royal couples at the time, they enjoyed a loving and happy marriage. María Ana capably ran the government when her husband was away (often in battle), and she was lauded for furthering relations between the two branches of the Habsburg family. The emperor was devastated by her untimely death owing to complications late in a pregnancy in 1646. The Habsburgs had long practiced close intermarriage within the family, which would soon result in the demise of the dynasty in Spain. The Infanta married a first cousin, and their daughter, Mariana, would marry her uncle, King Philip IV. Their union produced one sickly male child, King Charles II, who became the last of the Spanish Habsburgs when he died without producing an heir in 1700. The Spanish Habsburgs cultivated portraiture as a vehicle of statecraft. Portraits were displayed in the numerous royal palaces and were also dispatched to relatives and to other courts as diplomatic gifts and as tools in arranging marriages. Images of royals were carefully calculated to convey exalted status, as demonstrated in this characteristic work. The Infanta is shown full-length, a grand format befitting her rank, yet the setting is deliberately understated. She stands before a simple swag of drapery with her hand resting on a chair. Crowns or other symbols were deemed superfluous because the royal likeness alone was thought to communicate innate majesty. The Infanta engages the viewer directly, and it is important to recognize that her impassive expression was a required feature of Habsburg decorum in life as well as art. Spanish royals were trained from childhood to appear remote and thus superior, truly destined to rule. Men usually wore black, but there was no restraint in the display of women’s splendid clothing and jewelry. The Infanta’s cherry-red satin gown is studded with gems and embroidered with gold and silver thread. The dress is composed of two principal elements that defined the highly influential Spanish style. The busk (cartón de pecho) is a bodice with stiff ribs that corseted the waist and flattened the chest to maintain a rigid front. The shape of the dress is formed by a farthingale (verdugado) or hooped skirt. At this moment of realism in art, many portrait painters showed the mark of one of the hoops to break up the expanse of fabric in the front. The Infanta wears five finger rings and a lavish double strand of pearls. Pinned on her bodice is the grandest jewel in the royal collection, which regularly featured in portraits of Spanish queens and princesses. It comprised a large diamond, known as El Estanque (“The Pool”), and a perfectly symmetrical pear-shaped pearl, later known as La Peregrina (“The Pilgrim” or “The Wanderer”) because it had many illustrious owners. The pearl gained further fame in 1969, when actor Richard Burton purchased it for his wife, Elizabeth Taylor. When it was sold from her estate in 2011, it fetched the record price of $11.8 million at auction! The painter Felipe Diriksen was born in Madrid to a family with Flemish origins. Flanders was one of the possessions of the Spanish Habsburgs, and Diriksen’s grandfather, also an artist, had moved the family to Spain to serve Philip II. Diriksen was also a court artist, but his talents were rarely used for portraits because a much greater painter, Diego Velázquez (1599–1660), was Philip IV’s principal portraitist. It seems likely that the commission to paint this portrait fell to Diriksen because Velázquez was on extended leave in Italy at the time of the Infanta’s departure. Diriksen rose to the occasion, painting his finest work to commemorate the moment the Infanta left her family for a new life in distant Vienna. Write 10 words to describe this representation of Infanta María Ana. How would you describe the expression conveyed by her face and her posture? Without reading the portrait’s title, would you know that she was royalty? How does this portrait communicate her status? 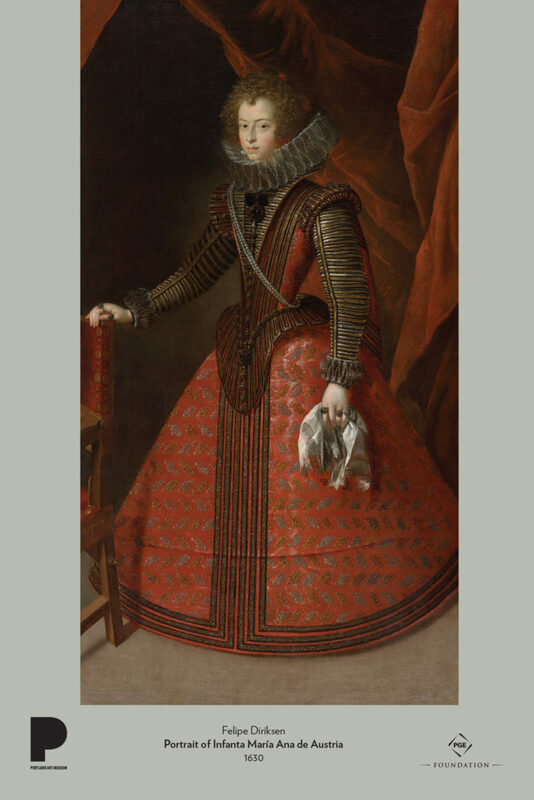 What does the portrait tell you about the expectations of royal women in seventeenth-century Spain? María Ana’s brother, King Philip IV, ruled over the first truly trans-global empire, the result of Spain’s rapid colonization of vast territories in the Americas and the South Pacific beginning in the preceding century. The principal justification for colonization was to spread Christianity to the far corners of the earth, but rich natural resources provided powerful motivation as well. Was this colonization justified? How does colonization relate to the social order established by the institution of royalty? Does royalty have any place in the modern world? The famous La Peregrina pearl worn by the Infanta was found by an African slave in the Gulf of Panama. It is said that he was freed for declaring his find. In what ways did the institution of slavery support the Spanish monarchy? Create a portrait of a politically powerful person in the United States today. How would you convey the person’s status through her or his pose, clothing, and jewelry as well as the setting or background?